After 1,700 years, dramatic discovery changes archaeologists’ entire understanding of Jerusalem after the destruction of the Second Temple. Jewish historian Josephus Flavius told of a small Roman-era theater built in the vicinity of the Western Wall in Jerusalem. But no one had seen it for nearly two millennia. Archaeologists beginning with Charles William Wilson have been searching for that theater for 150 years to no avail. Now it seems they’ve found it. As happens so often in archaeology, the theater’s discovery was by accident. Diggers were excavating a known Second Temple road under Wilson’s Arch (named for the British archaeologist) when they ran into flat stones placed unusually in a circle. It wasn’t an ancient traffic circle but a Roman theater which, when it was finally uncovered, changed archaeologists’ entire understanding of Jerusalem after the destruction of the Second Temple. That said, the theater was probably never used. The stairs are not fully hewn and there are rocks that have guide marks but weren’t fully carved, explained archaeologist Joe Uziel during a press conference earlier this week. What could have interrupted the theater’s construction? Uziel speculates perhaps it was the Bar Kochba Revolt, which resulted in the banning of Jews entirely from Jerusalem around 136 CE. The theater’s placement also suggests the theater may have been built as an insult to the former Jewish presence on the Temple Mount: its seats were arranged so that audience members would have their backs to the former center of Jewish worship and power. It also appears that the paving stones from the Second Temple road the archaeologists were excavating were repurposed for benches in the theater, and a drainage duct was lowered to make way for the seating. The theater’s discovery, while important, still doesn’t shed light on the ongoing mystery of what was happening on the Temple Mount in the period between the destruction of the Second Temple and Muslim rule. For example, was a Temple of Jupiter built on the mount? The theater is relatively small compared to other Roman theaters in the Holy Land, such as those at Caesarea, Beit She’an and Beit Guvrin. The theater remained elusive for so many years because it was buried eight meters under the current ground level of the Western Wall. Following a massive earthquake in 360 CE, Jerusalem residents – concerned that the arch would collapse – filled in the area with dirt and debris. The theater will eventually be opened to the public as part of the Western Wall Tunnel Tour. Excavation work will continue for another six months. 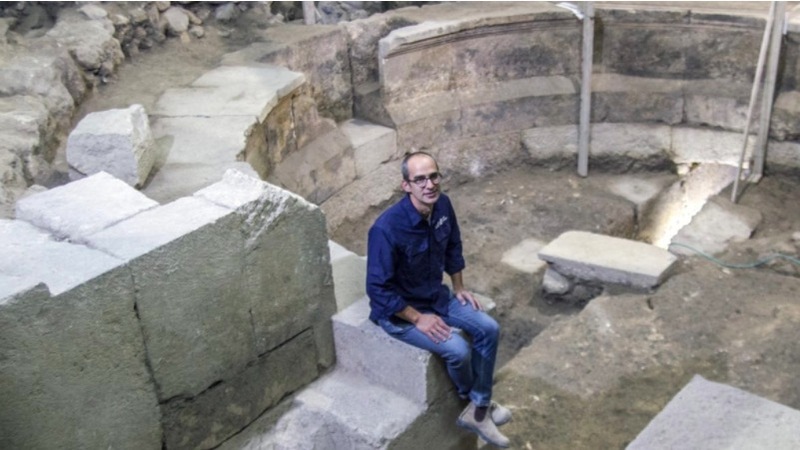 The archaeologists hope to connect the water drainage system in the area of the theater to the one in the nearby City of David, creating a new attraction for visitors. The archaeologists’ findings will be presented at the “New Studies in the Archaeology of Jerusalem and its Region” conference this week at the Hebrew University. Understanding thousands of years of history is so much more fun when you get into costume and try working and eating as the ancients did. Museums show you things, and sometimes let you handle things, which demonstrate a certain subject or era. Living history museums, on the other hand, invite you to immerse yourself in a recreation of a certain time and place with the help of costumed guides and interactive experiences in an authentic setting. It’s the closest thing to getting in a time machine and going backwards. Next time you’re touring Israel, especially with children, consider putting one of these living history museums on your itinerary. Genesis Land is situated in the Judean desert on the way to the Dead Sea. As its name suggests, this venue offers a guided biblical experience to visitors – while dressed in period costume — that includes a camel ride to “Abraham’s tent,” fresh pita baking, shepherding, mosaic making, drumming, pottery, scribal arts and other hands-on workshops as well as authentic kosher meals served in a tent. You can reserve a spot for overnight desert camping, guided jeep rides and camel treks, or book the site for an event. Information: 972-(0)2-997-4477. Ein Yael living museum is a former archeological site across the valley from the Jerusalem Biblical Zoo, dedicated to conserving ancient crafts found during digs here. Mostly it’s open by reservation. During the summer and school holidays, it features festivals and a recreated ancient Roman street filled with craftsman demonstrating arts of ancient times. There’s an animal corner with donkeys and goats, and workshops in wool weaving, basket weaving, mosaics, pan flutes and more. Groups of up to 30 people can arrange a private tour and two workshops, suitable for young children to adults. Information: 972-(0)2-645-1866. Located at Hoshaya, a Jewish community near Nazareth and Zippori (Sepphoris), Kfar Kedem involves visitors in recreating ancient day-to-day life in the Lower Galilee. Dressed in biblical garb, you’ll ride the rolling hills on a donkey, thresh grain and bake pita bread, milk goats and make cheese, spin wool, press oil from olives and juice from grapes. Israel’s is, to say the least, an old story, and a layered one. Scratch the surface of nearly anything here, and you will find yourself going back in time: Ottomans, Mamluks, Crusaders, Early Muslims, Byzantine, Roman—on and on, a bewildering litany of civilizations that have come and gone. The many tels that dot the landscape provide a perfect metaphor for the nation’s past: giant mounds of earth that represent multiple strata of human occupation, human bravado, human thinking. Many of the towns and cities are a historical jumble of architectural styles—nowhere more clearly seen than in Jerusalem, where Santiago Calatrava’s gloriously contemporary Chords Bridge soars toward the sky from streets that lead to some of the world’s oldest and most venerated structures. Or consider the proximity of Tel Aviv and Jaffa: at just over a century old, Tel Aviv is the infant sibling of Jaffa, whose foundations are thousands of years old. In its single century of life, Tel Aviv has developed from a discouraging line of sand dunes to one of the most beautiful and thriving seaside cities on the planet. In the 1920s and ’30s, as the metropolis began to flare into activity, it served as an open field for many Bauhaus and International Style architects, among them Genia Averbuch, Dov Karmi, Erich Mendelsohn, Josef Neufeld, and Arieh Sharon. The handiwork of such designers—more than four thousand still extant buildings—sets the architectural tone to this day throughout the city: pale stucco; simple, curving balconies; and solid, minimalist building blocks. Because of these stylish Bauhaus-inflected buildings, the so-called White City of Tel Aviv was deemed a World Cultural Heritage Site by UNESCO in 2003. Contemporary architects have taken up the mantle from their innovative forebears, bringing new shapes and ideas to Tel Aviv’s streets and plazas. The Tel Aviv Museum of Art, designed by American architect Preston Scott Cohen, is a stunning example: it soars out from the original building like a white marble prow of a ship, dotted with small triangular and rectangular portholes. Its interior is filled with architectural motion: angles and trajectories that direct the roving eye and the roving feet—leading visitors from one gallery to the next. The Design Museum Holon is a small institution housed in what might be described as a colorful riff on Frank Lloyd Wright’s famous Solomon R. Guggenheim Museum in New York. Designed by artist-architect Ron Arad, the museum’s exterior resembles swirling lines of ribbon in shades gradating from orange to deep rusty purple. The museum opened its doors in 2010; since then the themes of its shows have been wide ranging, including: the nexus of technology and fashion, Japanese master couturier Yohji Yamamoto, designer/illustrator Bruno Munari, 3-D printing, Bedouin women’s folk art, bicycle design, and an examination of the role of shade in urban settings (of particular interest in a country as sunny as Israel). The Design Museum is transforming the city of Holon into a cultural destination. Architects Itai Paritzki and Paola Liani’s offices are in a small, handsome building on Lapin Street in Neve Tzedek. Nestled in these modest headquarters, the two of them are busy sorting out some of the problems of the future. Liani describes their approach: “We work a lot with the site and with nature: wind, light, sun, and water. So the site, in a way, is the spirit of the project all the time.” In 2011 this notion was made manifest in their magnificent Barud House in Jerusalem, which they describe as “subdivided into three main themes: Jerusalem, a city of rock and stone; wide aerial views; and the sacred architecture of multiple religions intersecting in the skyline.” In Neve Tzedek, they designed a building that fits into its location so discreetly that it has been nicknamed “the Invisible House.” “The idea,” says Liani, was “to keep the Tel Aviv soul, in a way—between sky and sand. Nothing more than that. Very quiet.” For these architects, site provides all the inspiration they need. In 2015 their Marc Chagall School opened in Neve Tzedek: built around a quiet courtyard, it features façades enough to showcase the work of the painter for whom the school is named. Paritzki/Liani are forward thinkers: like many in their country, they are thinking outside the usual parameters in a quest for new solutions. Why not break every architectural rule about stasis and stability? How about a structure with moving and interchangeable parts? Could they design a building that breathes—that is not only sustainable and ecologically sound, but that provides sustenance? These architects don’t think these ideas are in the realm of science fiction: they are allowing creative innovation, combined with know-how and the willingness to take a risk, to guide them to solutions.